STATE COLLEGE, Pa -- The whiteout at Penn State is one of the most mesmerizing scenes in college football. With more than 100,000 fans dressed in white, Beaver Stadium virtually glows as night falls in Happy Valley. Penn State coach James Franklin tells his players to drink in the spectacle when they take the field. "Run out of that tunnel. Look around for 30 seconds and then don't ever look again and then get back to focusing on the game and controlling what we can control," Franklin said. What No. 2 Penn State controlled on Saturday night was Michigan. The Nittany Lions turned their whiteout into a knockout of the 19th-ranked Wolverines. Saquon Barkley and Trace McSorley cut through one of the nation's stingiest defenses, each scoring three touchdowns, as Penn State emphatically avenged its last regular-season loss with a 42-13 victory. 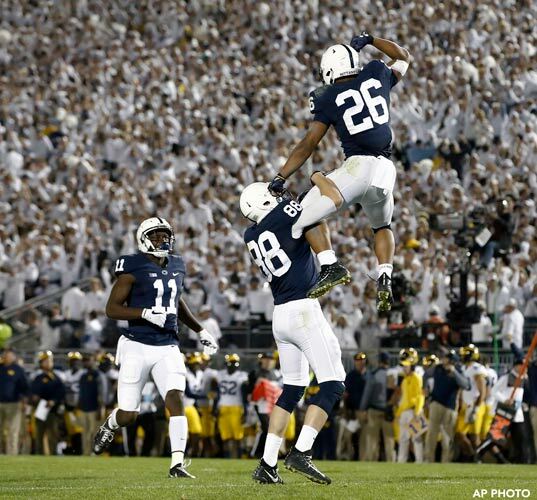 Penn State's Saquon Barkley (26) celebrates with Mike Gesicki. Barkley set the tone the first time he touched the ball. He took a direct snap on the second play of the game and blazed 69 yards for a touchdown. He finished with 161 yards from scrimmage, a nice addition to his Heisman Trophy bid. "Obviously we knew they were very aggressive. They're a great defense, got a great defensive coordinator," Barkley said. "Sometimes it seems like a heavyweight fight. They're going to get some and we're going to get ours. When you got your opportunity, you got to score." McSorley ran for a career-high three touchdowns for Penn State (7-0, 4-0 Big Ten), including a darting 13-yarder in the third quarter that made it 28-13 and led the record-breaking crowd of 110,823 to sing along to "Sweet Caroline." Early in the fourth quarter, McSorley and Barkley combined for the shot that put Michigan away. Barkley burned linebacker Mike McCray and made a juggling over-shoulder catch for a 42-yard TD that made it 35-13. Michigan came in allowing 223 yards per game and 3.68 yards per play. Nittany Lions went for 506 yards and 8.3 per play, adding a few new looks to its offense, like the wildcat formation Barkley broke for the first touchdown. "Instead of lining up and sending the quarterback out wide we shifted to it at the last minute so they couldn't go to a wildcat check," Franklin said. "We had some wrinkles in there." Penn State has not lost in the regular season since getting trounced 49-10 by Michigan (5-2, 2-2) last season. That seems like a lifetime ago. One day short of the last whiteout, a season-changing upset of Ohio State, the defending Big Ten champion Nittany Lions look even better than last year. Michigan: The Wolverines don't have the offensive playmakers to keep up with a team like Penn State, which gets chunks of yardage from Barkley, DaeSean Hamilton and Mike Gesicki. John O'Korn was 16 for 28 for 166 yards. He was sacked seven times and had a second-half fumble. If the Wolverines can't win with a grinding running game and defense, they can't win. "We're going to refit, retool, and get back to work," Michigan coach Jim Harbaugh said. "There are more opportunities ahead of us." Penn State: The matchup between Penn State offensive coordinator Joe Moorhead and Michigan defensive coordinator Don Brown - two of the best in the country - went to Moorhead. Penn State was successful attacking the edges of Michigan's D and consistently got the one-on-matchups in the passing game that worked in its favor. "The quarterback was really hot and the receivers made plays down the field," Harbaugh said. The last time Michigan allowed as many points in a game was in 2015 against Ohio State. Michigan: The Wolverines are in danger of falling out of the rankings. Penn State: There was some question about whether Penn State or Georgia should be No. 2. The Nittany Lions likely won over some doubters. Penn State has outscored opponents 90-0 in the first quarter, making it the only FBS team that has not allowed a first-quarter point. "When you have an explosive offense like we do and you're playing really good first quarter defense and you can get a lead, it changes how people have to play," Franklin said. "So we play with an aggressive mindset and an aggressive mentality in all three phases and it's working out pretty good for us right now." Michigan: The Wolverines have Rutgers coming to the Big House and the Scarlet Knights have won two straight. Penn State: The second game of a three-week stretch against ranked teams figures to be the toughest for the Nittany Lions, who travel to No. 6 Ohio State next weekend.